GreenGeeks Review: GreenGeeks web hosting prides themselves in being a "300% Green Web Hosting" company. This means they are doing everything they can in helping protect our environment. Their web hosting package is packed with features that do not cater to one specific person. They have web hosting tools for the novice looking to build a web site all the way up to web masters, and everyone in between. They provide template application for the novice and PHP, Python, RoR and more for web masters. There is no need to worry about upselling with GreenGeeks. Their web hosting package has all you need and the price is very affordable. Be prepared to pay for the one or two year plan all at one time. GreenGeeks prefer to put their time and money into servicing your web hosting account rather than billing you every month. GreenGeeks also provides you with 24/7 toll-free support and a 30 day money back guarantee. 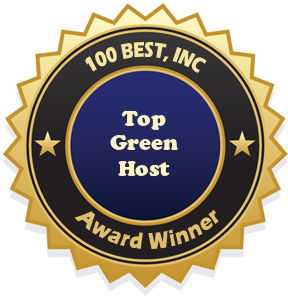 Statement From GreenGeeks: GreenGeeks.com is the world's #1 best GREEN ENERGY WEB HOSTING company. The Green Geeks management team has over 40 years of combined experience in providing high quality, affordable web site hosting. Your account will utilize only the best server equipment, the most dependable network and the most up to date software programs available. Your Green Geeks account will have a positive energy influence on the environment as we replace, 3 times the amount of energy your web site will use, with wind power credits.